by Archbishop Antonio J. Ledesma, S.J. 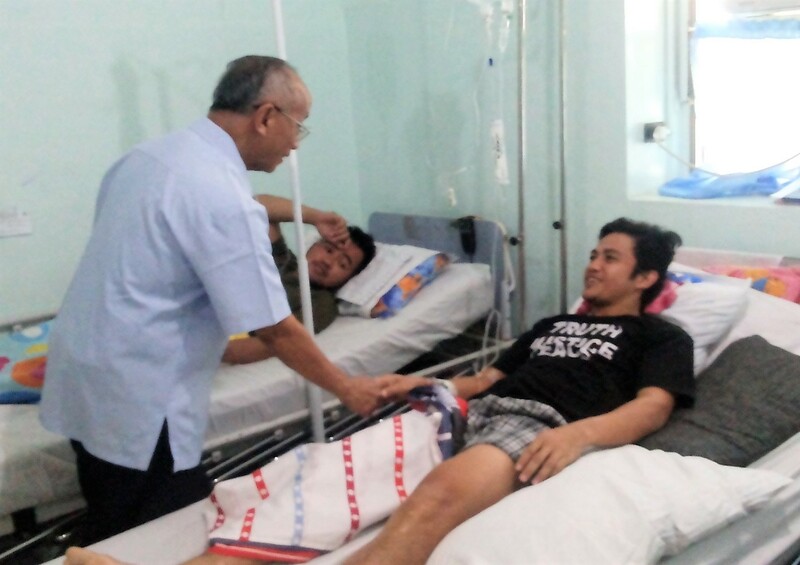 Last Monday, July 31, after the fiesta Mass of St. Ignatius Loyola at the chapel of Camp Evangelista in Cagayan de Oro City, I visited the wounded soldiers in the military hospital. There were more than 80 of them filling the rooms, with some having to lie on beds along the corridors. One had an amputated arm, several had shrapnel wounds on different parts of the body, others had casts on their arms or legs. A number showed me near – misses of shrapnel around their eyes. Many more of the wounded were lying down or seated with dextrose bottles hanging near them. The more severely wounded had already been flown to Gen. A. Luna Hospital in Quezon City. What struck me most was the youthful demeanor of many soldiers – many in their early 20’s. About a dozen soldiers had wives or relatives watching over them; some had two or three children left at home; but the majority were left alone, coming from distant provinces – Apayao, Tarlac, Nueva Ecija, Cavite in Luzon; Samar, Leyte, Cebu, Negros, Iloilo in the Visayas; and various parts of Mindanao, including some Muslim soldiers from Jolo. As we left the hospital, two Huey helicopters from Marawi were landing – one with more wounded soldiers and the other carrying the dead. This is one face of the battle of Marawi. The most recent casualty count includes 114 soldiers killed with seven or eight times more that number wounded. Rebel casualties are reported at more than 700 killed; and an indeterminate number of civilians killed or missing. Another image of the Marawi conflict are the lines of Muslim women and children with some men, waiting to receive relief packs as their names are called by a local leader reading from a prepared list. On July 18, I joined our relief team from the Archdiocese of Cagayan de Oro and St. John Vianney Theological Seminary. We distributed relief packages to 430 families in six barangays in Marawi – Bgys. Bito Buadi Parba, Bito Buadi Itowa, Eunie Punod, Pagalamatan, Bubong Lumbac and Mipaga. One could see from their courteous greetings and smiles that the Muslim residents appreciated our coming, since this was one area that had been reportedly neglected by aid agencies. Some of the religious sisters with us tried to conduct a brief trauma – healing session for the children by means of some games. Occasionaly, one could hear the sound of bomb explosions coming from the other side of the hills separating these barangays from the fire fight zone. Some residents showed us several M-75 stray bullets that lodged in their houses. Earlier on June 8, in Bgy. Barra, Opol, bordering Cagayan de Oro City, our Social Action team with some religious sisters and ministry co-workers distributed standard packs containing five kilos of rice, Milo, coffee, dried fish, some canned goods and toiletries to 500 Muslim families. These were evacuee families from Marawi preferring to seek shelter with their relatives rather than staying in evacuation centers. Indeed, government agencies report that 90% of Muslim internally displaced persons (IDPs) could be classified as home-based rather than staying in evacuation centers. In Barra, the distribution of relief goods was done at the four mosques, with the help of the local imam (or religious leader) of the mosque. In all, our SAC team and volunteers, headed by Fr. Satur Lumba and Mr. Carl Cabaraban, has distributed food and relief packs to nearly 3,400 families in 16 city parishes and barangays – such as Kauswagan, Cogon, Camaman-an, Iponan, Carmen, Macabalan, Consolacion, Lapasan, Cugman, including Oro Jama-ah Masjid mosque near Cogon market. Likewise, our SAC team together with other volunteers has brought over the past two months relief goods to 368 families in evacuation centers situated along the road to Marawi, in Baloi, Lanao del Norte and Saguiaran, Lanao del Sur. We are grateful to many donors and partners in our relief work. These include: CBCP-NASSA; Xavier University; Lourdes College; Peace and Equity Foundation; the RVM, RGS, DC Sisters with the Association of Women Religious of Cagayan de Oro; Catholic Women’s League; Couples for Christ; CFC-Gawad Kalinga; Tanging Yaman Foundation with Fr. Manoling Francisco, SJ; Sen. Koko Pimentel; Atty. Rufus Rodriguez; the Diocesan Social Action Centers of Bacolod and Legazpi; and many of our parishes (Gingoog, Balingasag, Claveria, Balingoan, Cathedral, Camaman-an, Xavier Heights, Villanueva, Mahinog, Consolacion, and Sacred Heart). In the midst of war and destruction, our relief, rehabilitation and reconstruction efforts will continue together with many other government and non-government organizations. And this perhaps is the shining light from Marawi in the midst of gloom – that Christians and Muslims have learned to help each other (even as in some cases they have died together), and that the re-building of Marawi can be done with the collaboration of all sides aspiring for peace and development in Mindanao.